Dust Collector - exterior exhaust and wet scrubber? I’ve read a lot of the posts on dust collectors, there seem to be some generally accepted rules of the road but also a lot of room for interpretation and personalized approaches. One size definitely doesn’t fit most. I am getting back into wood working and am in the process of setting up my shop. I have a Delta unisaw and 6” jointer and a 10” miter saw along with powered hand tools. I’m looking at how best to work handle dust. 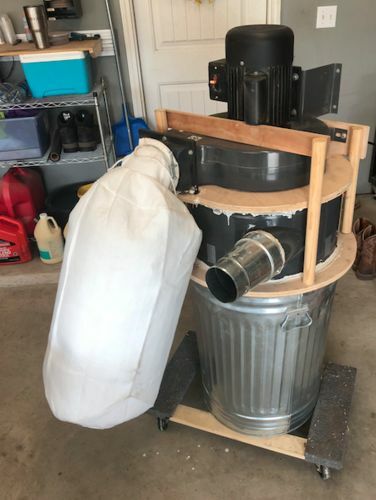 Currently I use a shopvac connected to a simple 5 gallon bucket lid venturi chip collector. My shop is 25×40 and about 100’ from my home. My shop and home are set back in the woods well away from neighbors and I’m not worried about impacting them. My house is about 100’ from the shop. That said, What I am considering is a 2HP HF dust collector with a cyclone and exterior discharge. Due to the location of the shop, I’m not worried about impacting neighbors, but I am concerned about a dust plume heading toward the house. To address this, I thought I might do is try to build a simple wet scrubber. I would duct the exhaust with the fines into an open 55 gal drum, and use a shower at the rim. The bottom third of the drum would act as a sump and I would use an electric sump pump to recirculate the water. In tandem with this, I am thinking about mounting an axial fan at just below the rafter level to blow air out a vehicle access door to try and carry the suspended dust out of the building and get some air changes.. I would also wear some sort of respirator or PAPR during heavy dust generation. I might be out of left field and I appreciate any thoughts. 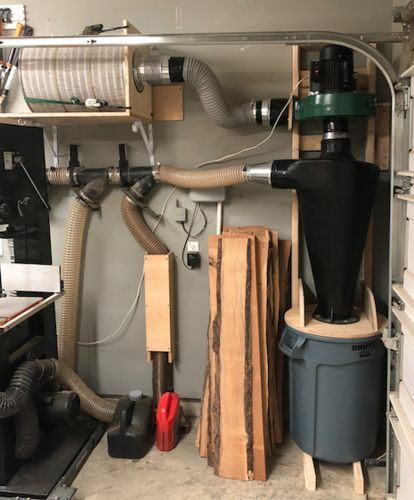 I’m not afraid to spend money on a good dust collector, but I think that if I can exhaust external and then use some sort of post discharge control that I can get something reasonable without spending thousands. Thanks for reading and look forward to any feedback. Just remember that if you vent to the ourside you will have a negative air pressure inside and will continually be drawing ourside air into your shop. Something to think about if needing HVAC in your shop…. Skip the wet scrubber, you are way overthinking this. The discharged dust should be fairly minimal, and should also only be the finest particles…in the 100’ to the house they will be dispersed sufficiently that it won’t be a problem. But try this: build your setup without the wet scrubber and try it for a few months. Then make a judgement about adding it to the mix. I haven’t seen any evidence of dust building up on the bushes right by the vent so I think the Super Dust Deputy is doing its job. I’m sure you could vent to the outside with no issues—especially given the location of your shop. I’m curious why you would do this? Is it to avoid having to check and empty the dust bin or does this somehow improve the efficiency? Are you moving the entire dust collector outside or just redirecting the exhaust ducting? Are you planning to remove the filter? I think the cyclone should help reduce the discharge to just the very fine dust. Given the distance from the house I think you should be ok and it will be unnecessary to wet the dust to knock it down. I guess alot depends on how much breeze you get and the direction—to avoid dust blowing back into the shop in the summer time. I suppose if you do not have a fine filter on your dust collector then venting outside will probably reduce the airborne dust in your shop. 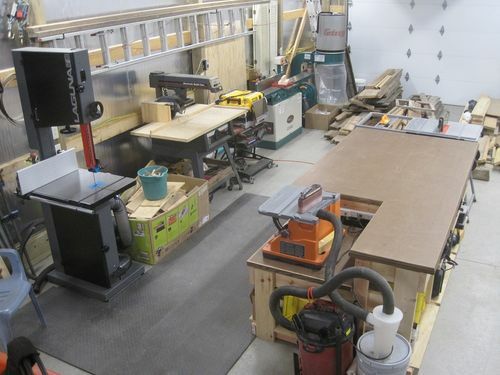 Moving the entire collector outside would reduce shop noise and free up space. Fine dust is bad for you, but even if the wind were blowing it directly towards your house, I think it would spread out so much before moving 100’ it wouldn’t matter at all. I’d be more concerned with making sure the intake vent to your shop for the make-up air doesn’t draw the dust back in. And I agree with the others that a water system is solving a problem you don’t have. No question you will be pumping heated/cooled air outside when running the dust collector. And you would completely exchange the equivalent of all the air in the shop in about 15 minutes. But unless you are running the DC constantly, this probably isn’t an issue. Even exchanging all the air in the shop, is not the same thing as cooling the shop down to outside temperature. The air itself doesn’t hold that much heat, the heat’s in the walls, floor, and stuff in the shop. It will cool the shop, but I’d guess most of the time you won’t even notice. Of course it depends on the project, but I think most of us doing hobby work, make some cuts, scratch our heads for 30 minutes, make a few more, and so on. So the machines and DC are not on all that much. Obviously a production shop is a completely different situation.